Considered I. Vernon Hill’s masterpiece, the Crosby house is the architect’s introduction of his “Ornamented Cube” style, which embellishes a square or rectangular box with flared dormers, gables, and classical detailing. 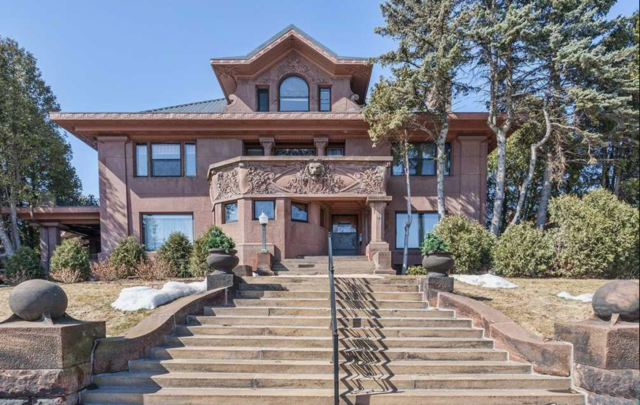 The sandstone structure features carvings by master stone sculptor George Thrana, who also did the stone carvings on Historic Central High School and many other Duluth buildings. George Crosby helped develop the Cuyuna Iron Range and founded the town which bears his name. As of March 2018, this property is for sale. See the Edina Realty listing here. 5 N. 23rd Ave. E.